Watching the Aurora Borealis, or Northern Lights, is something most of us have very high on our bucket list. Only a few, relatively speaking, have actually been lucky enough to see the Aurora in its full glory. Due to the fact that the Aurora Borealis is a natural phenomenon taking place over the Arctic regions of the world, it’s also logical that the more north you are the more chance you have to actually witness it. The Aurora is triggered by collisions between electrically charged particles from the sun, due to flares on the sun’s surface, that enter the earth’s atmosphere. The resulting strength of the Aurora depends on the power of the solar flares and the angle relative to the earth. There’s a lot more at work here of course but these are the basics. Solar flares and possible Aurora’s occur throughout the year but in the summer it is simply not getting dark enough to be able to witness it. The winter is therefore the best period for the Northern Lights, roughly from early October to end of March. 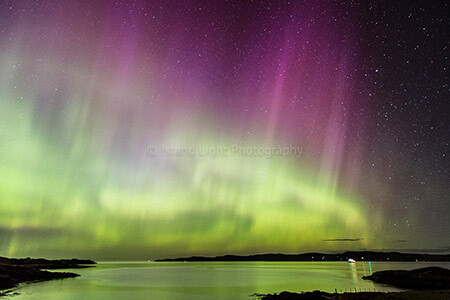 By the way, if you’re in Shetland the Northern Lights are also referred as Mirrie Dancers. More and more folk book expensive trips and travel from all over the world to Iceland, Alaska, Norway or Finland for instance to try and get a glimpse of the Aurora and to hopefully take a few pictures. These trips however don’t guarantee success as the Aurora is somewhat unpredictable, after all it depends on solar activity. So before you spend all your money on an expensive trip north you might want to consider staying closer to home where the chances of an Aurora might be somewhat slimmer than in Alaska, but where you still have a fairly decent chance of seeing them. So how about chasing the Northern Lights in Scotland? I myself live in the south west of Scotland and have seen the Aurora several times from close to my home and a few times from the north-west of Scotland. And I could have seen it more often if only I hadn’t been so lazy when I went to bed instead of staying up and going outside to watch the lights. How do you know there is an Aurora expected? In order to be able to watch the Aurora a few conditions have to be met. First of all the Aurora has to be active, I’ll let you know later on how to find that out. Second of all it has to be an almost cloudless night. It’s also important not to have full moon. You also have to be in a very dark place with as little light pollution as possible and you need to have a clear horizon towards the north as that’s where you are likely to see it first before eventually it becomes strong enough to see it overhead, that is if you’re lucky! To find out if there is an Aurora expected, or happening right now, make sure to be prepared properly. The first thing you need is to be able to receive alerts when there are chances of seeing the Northern Lights. For an excellent resource with email alerts please visit www.aurorawatch.lancs.ac.uk. Another, more comprehensive website with alerts, live information and maps, is www.softservenews.com. On the latter you will also read about KP numbers which say something about the strength of the Aurora. 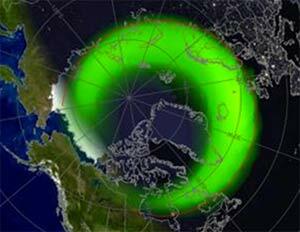 KP Numbers can be between 0 and 9 and indicate the most southerly latitude where the Aurora can be seen. So an Aurora with KP3 might be visible as far south as the middle of Norway where KP5 might be visible as far south as the north of Scotland. KP9 can potentially be visible as far south as the south of England. Both sites mentioned in the previous paragraphs also offer Smartphone Apps. My personal favourite is Aurora Forecast by Tinac Inc for iOS and Android. It can be somewhat overwhelming to see all the information but with a wee bit of practice and experience you’ll find out that you can’t do without them. There are also many other Aurora apps available and I’m sure there is something for everyone. Plan ahead and try to find a location while it’s still light and remember it for a night when you’re going out. When you do have a very dark night and you still have to find a spot it can be very difficult to both find a parking space for your car and have a solid underground for your tripod. Try to include something interesting in the foreground such as a Loch or an interesting building, something you can only judge properly during daylight. Make sure to dress up warm as the wait can be long and don’t forget to bring a torch! 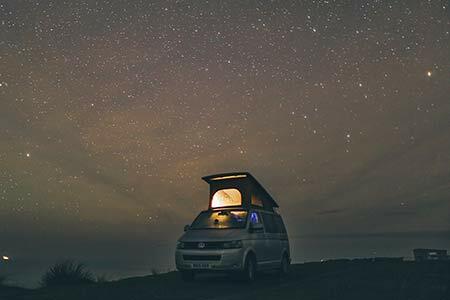 If you’re coming to Scotland for the purpose of chasing the Northern Lights hiring a camper-van or motorhome might be a perfect solution for you as you can find a great place during the day and basically stay there and wait for the Aurora with all the comforts and a warm place to wait in. Friends from Bunk Campers told us that more and more people rent a motorhome in the winter for the sole purpose of chasing the Northern Lights in Scotland. Now that we have the alerts covered it’s time to get prepared to go out and actually try and see the Aurora. If you have mobile data coverage in the location where you are planning to watch the Aurora you can follow live alerts via email and twitter. Unfortunately it’s my experience that the places which are the darkest and most remote are lacking just that so you have to rely on eyesight as well as have a LOT of patience. The start of the Aurora can come sudden or can gradually build up. I’ve seen on several occasions a whitish arch on the northern horizon which later seemed to climb higher and resulted in a visible Aurora KP 6. I’ve also seen grey and whitish curtains hanging in the sky which suddenly started to blink and turned greenish, that was KP 7. Most times however I’ve seen a distant green glow on the Northern Horizon of Aurora’s with a KP number of 4 or 5. Don’t let the pretty pictures of Aurora’s on the internet fool you. There is a good chance that you only see the greyish curtains or faint greens I just described while your camera picks up stunning red, purple and greens after a 20 second exposure. 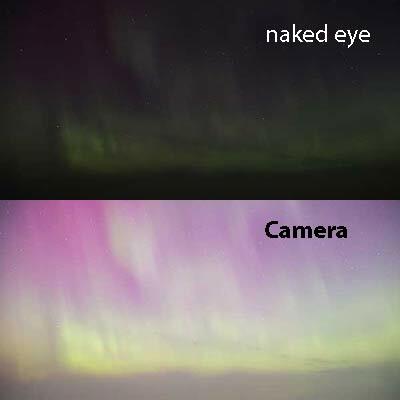 It’s not that your eyesight has a problem, there is a logical explanation for that: “Human eyes can’t see the relatively “faint” colours of the aurora at night. Our eyes have cones and rods – the cones work during the day and the rods work at night. Cone cells, concentrated in the fovea in the central area of vision, are high resolution and detect colour in bright light. These are the main cells we use for vision in the daytime. Rod cells, concentrated in the periphery around the outside of the fovea, can detect much fainter light at night, but only see in black and white and shades of grey. So the Aurora only appear to us in shades of grey because the light is too faint to be sensed by our colour-detecting cone cells.” That also explains why the alert above mentions that the Aurora is visible to the naked eye in the north and photos are likely from anywhere in the UK. The camera picks up a lot more colour than you do! I must admit that I, like many others, haven’t seen the bright green, purple and red colours of the Aurora with the naked eye the same as my camera did record them. For that to happen the Aurora needs to be much stronger to actually witness more than a green glow and greyish mist with the naked eye. That’s something I’d love to see as well. I don’t think there is one fixed rule for photographing the Aurora. What you definitely need is a sturdy tripod, a DSLR with a wide angle lens of at least 35mm, the knowledge to focus your camera in the dark, which is not always easy but Live View and a bright star can help here, and a tool to remotely release the shutter to avoid camera shake. The settings below are a guideline and will vary depending on type of camera and lens. Use a shutter speed of 15 seconds to start with. Check the photos in the viewer and play around with some of the settings if you have under or over exposure. You’ll be surprised of the stunning colours in your viewer compared to what you see with the naked eye. I hope the information I’ve provided here will help you to see the Aurora Borealis yourself. I’m in no way an expert in Aurora watching, neither am I an expert in Aurora photography. I’m just a passionate photographer with a great interest in the natural world around us and a particular interest in what must be one of the worlds most spectacular phenomenons, the Northern Lights. Hi! This is a really great post, very informative! 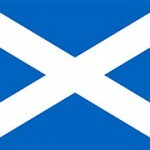 Are there any aurora hunting tours in Scotland? I tried Googling but nothing came up..
Great post! I’ll definitely go Aurora hunting next time I’m in Scotland! after reading your great post, I have decided to travel to Scotland, and if we are lucky we will see Aurora Borealis. Our trip will be in February, What area do you advise me to stay in order to have a better chance of seeing it ?. Thank you so much for everything. So is there next to no chance of seeing them in the summer? the tail end of August? Just trying to plan next years holiday, and due to term times, would ideally like to RV it around the north coast. Are there organized tours where we can be driven out to an area to see the northern lights? We are going to be in Edinburgh on 10/8 and 10/9. If so, are the tours overnight or could we drive out for one night and then go back to Edinburgh. I’ve seen so many conflicting things on this. Thank you for your help! Hi Ron. I will be in Aberdeen with a friend at the end of November and we would like to try and see the lights. Where do you suggest we go? I am also trying to find a tour guide to take us. Do you know anyone? Thanks. Hi Flavia, if I was to pick a good spot I’d try it between Fraserburgh and Macduff. There are many very dark places there with excellent uninterrupted views towards the North. Another nice spot could be Slains Castle north of Cruden Bay as it’s in a very dark spot as well. I don’t know any guides in that area I’m afraid. I hope this helps! I’m stayein Edinburgh 17th-20th Feb 2019……can you plz recommend the best spot for viewing the aurora….. Perhaps I will. Be able to travel for an hours worth.. Distance wise from Edinburgh. My partner and I are travelling to Nairn in February. Is there anywhere close that you would recommend for seeing the Northern lights?